A great breakdown of some great people who will be attending. I'd counter that, well.. you definitely could meet customers. If you're a Startup or SaaS provider, offering a useful service or product to other web development shops, startups, or marketers, it's a good place to be to spread the word and swap info. For example, I know that a bunch of people found out about Freshbooks a few years back from being at the conference and mingling. I agree you may meet potenial customers, but I think that is very different than going solely for the purpose of meeting leads. 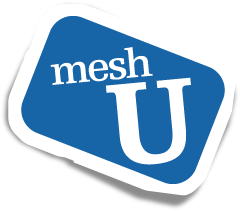 MeshU is not a tradeshow, but it is a great collection of early adopters and technofiles that are always looking for the next big thing. Startups are amazing things. And relentlessly resourceful founders will always be looking for a product or service that helps them build their product, get customers, etc. faster, better, smarter, cheaper, more reliable. And these are the folks that are kicking around the halls at MeshU. And I totally misread “See you in the hall” as “See you in hell”, which made me laugh because that may be where I'm going but I didn't think it was so obvious. I'll see you at MeshU. Good article w/ informative slide decks… so much for studying accounting. Not to oversimplify, but customer-centric business models are nothing new. It’s adopting the right technologies to achieve strategic aims that makes your work an order winner. That said, I love the part about "unlocking" added functionality via referrals, so long as it doesn’t diminish the experience for non-referring customers. 1/ Sean’s concept of Huge Addressable Market isn’t something that I’ve called out specifically in my framework. I’ve made an assumption here that the work around estimating an addressable market has been done, and although you’ll be revisiting this each time you come back to segments, it isn’t something that I’ve called out as a distinct marketing function. 2/ I don’t know if I totally understand what Sean calls the "Gratification Engine" but it probably includes at least some of the pieces of my framework you include there plus "Sales Process"
3/ Sean’s growth engine if I understand it correctly is all about how you acquire customers at a profit. In my framework that’s a combination of market strategy, the business model and your tactics (lead generation, retention and visibility). It’s neat to see Sean’s stuff and mine mashed up together so I’ll have to think more about it. I think they were created for different purposes. Mine was designed as a practical framework for startup marketers who are asking the question – "Am I doing everything I need to be doing?" I view Sean’s as a yardstick for folks to decide "Can this be a really big business?" I’d love to hear Sean’s thoughts on it though…. Either way I’ve had more theoretical discussions around marketing in the past 2 weeks than I’ve had in the past 10 years which I think is awesome! Thanks so much for sharing this. Customer-centric models are a little different than the proposal of the gratification engine. The gratification engine (and the cluster immune system) require the systems including the measurement and deployment to be automated. You have customer performance, i.e., business metrics baselined and then you A/B test or track promoted changes against the baseline and automate the stay at trunk or rollback to previous iteration. The idea is that it is fundamentally the user/customer performance data that alters the application. I do like the gratification approach to features. It’s about a reward system and making users and potential users play an achievement and social game. I agree. I think Sean’s model was these are the pieces in the go-to-market plan that a startup needs to make sure they are "high potential", venture fundable, etc. I started thinking about using this to flavour the traditional tactics and strategy. I’m thinking that the premise is that everything can be measured. All designs and tactics have an impact on the applications performance. If you’re measuring everything you can determine the effectiveness of design changes and marketing strategies. It’s particularly true of inbound marketing techniques. The gratification engine for me is where the game mechanics arise. How do you engage potential customers in a game? One method is where they share the social graph with existing customers. It’s harder if they are just random or from other channels. But if you’re delivering a compelling value proposition, then the better you design the game and experience the easier it should be to keep them achieving levels and helping you with your lead generation. Hi David, great to see you building on and combining some of the ideas/observations discussed at meshu. To me, gratification is the hardest and most important part to get right for a startup. I include messaging, funnel, and the ultimate gratifying experience as all part of the gratification engine. It’s really about making meaningful promise and then delivering the experience that matches that promise to the users. Also, not sure whose ROI you were referring to when you wrote "ROI Tracking." If it’s the customer’s ROI, then gratification is probably the right place. Otherwise, it probably should be in growth or economics. Just my thoughts of course. It’s all debatable.